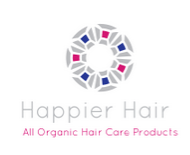 Happier Hair is a business targeted towards women of all ages with healthy and unhealthy hair. 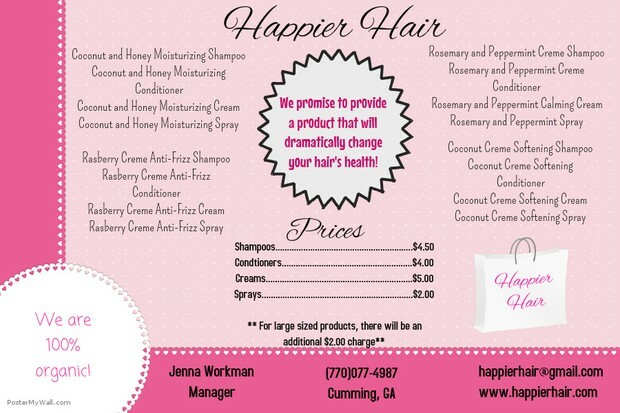 Happier Hair plans to offer a wide variety of hair care products for women with any type of hair issue. My business will be located at The Collection on exit 13, next to Barnes and Noble. It will be a small boutique that offers all things related to hair. Some products will include hair masks, mists, oils, accessories and much more! Our employees will be perform to the best of their abilities and strive to help customers with any questions they may have. To work at Happier Hair you must be at least 18 years of age. Employees must be able to stock shelves, work well with customers, have a friendly attitude and always be organized and on-time. I decided to start Happier Hair for women of all ages who have both healthy and unhealthy hair. I chose to create this product because I used to suffer from unhealthy hair. I searched high and low for a high-quality hair care product but never had any luck. I have found that there is typically a high need for decent quality hair care products that will not damage hair. Our product is different from others because it contains all homemade and organic ingredients. I have noticed that many other hair care products tend to break and damage hair but with Happier Hair hair care products, women will see a dramatic change in their hair than the way it was before. I think this business will be very successful because women will finally be able to invest in a product that will offer true results. Happier Hair will be a sole proprietorship, which means it will be a business that is owned and managed by one individual who receives all the profits and bears all losses. This type of business will allow me to further people’s interest in homemade organic hair care products that will better the customer’s hair. Once I have a high interest from people around the world, I can move up to a partnership, thus allowing people to invest into my business which can then expand. A sole proprietorship will allow me the benefits of: easing into and out of business, control over all profits and business operations, pride of ownership and lower taxes. Some potential disadvantages I will have to deal with are: unlimited liability, responsibility of all losses, management knowledge and raising financial capital. Original: As the price increased, the demand for the product decreased. 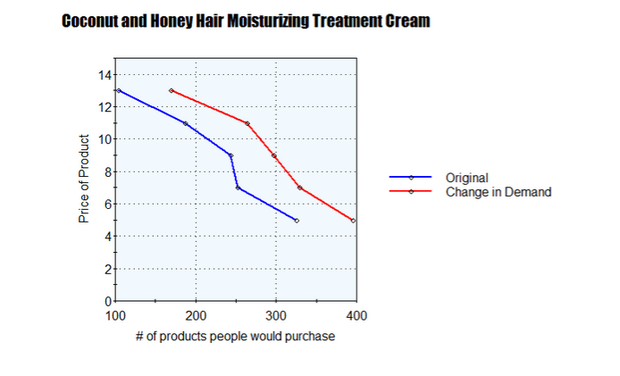 People did not want to buy many products once the price increased because they would be spending twice as much money. Change in Demand: When the price of the second product was lowered, the demand for the product increased, but as the price increased the demand decreased. People wanted more of the product because the second product was cheap and they could buy more of each. The total starting costs includes each item listed above in the table. I include the monthly cost of leasing the building instead of the yearly cost. Each item listed was thoroughly researched to find the best prices for the business. I have listed every item in detail of what will be needed to start Happier Hair. These items will enable me to get the business going and will create a welcoming environment to the customers. The hair care industry is highly competitive because customers want a product that will make your hair healthier and happier. We are a monopolistic competition. As for local competition, the market is both saturated and unsaturated. Hair care products are sold almost everywhere, however; there are very few stores who carry homemade organic hair care products. All of our products are homemade and contain all organic ingredients. We offer our products at reasonable prices so that our customers feel like they are paying a decent price for a large amount of product. Happier Hair will be different from any other business because we promise a hair care product that will better change your hair. Happier Hair is aimed towards women of all ages. I decided upon this product because many hair companies promise that once you buy their product they will deliver amazing result, but the results never show up. With our all organic hair care products, we promise amazing and drastic changes to your hair. We will be advertising on social media, within hair salons and we will be placing posters around the area so that customers will be more aware of what we are all about.